The Meltron LED Lighting Profiles offer an impressive solution for lighting special areas, such as display cases, bars, kitchens, refrigeration equipment, shop windows, and information boards. Available in several different lengths, the Meltron LED Profile Lighting allows you to light your subject just the way you want. Luminous efficacy is exceptional, at over 100 lm/W. The profile has an energy consumption of 7 W/14 W per metre. 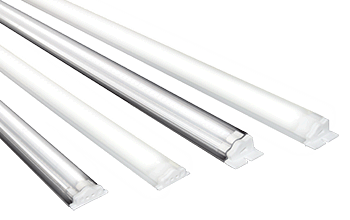 Our LED Lighting Profiles are the best solution for refrigeration or other temperature-critical applications. They work perfectly at low, or room temperatures, and displayed products stay at their required temperatures, as the profiles emit very little heat.ails, while several luminaires together, create a beautiful, smooth overall atmosphere.